Ohikizuri are kimonos of which the bottom is made very long so that it drags on the floor. Those kimonos are used a lot as wedding clothes, but they are also used for theatrical costumes and geishas also wear them. A long-sleeved ohikizuri kimono would be called a “hikifurisode.” Originally in the Edo Era, the bottoms of the short-hemmed kimonos gradually became longer, and although long-bottomed kimonos became in style they were not necessarily regarded as formal wear. Also, the “ohashori” was invented to tuck up the bottom of the kimonos for ease of walking, originally there were no ohashori made with ohikizuris. 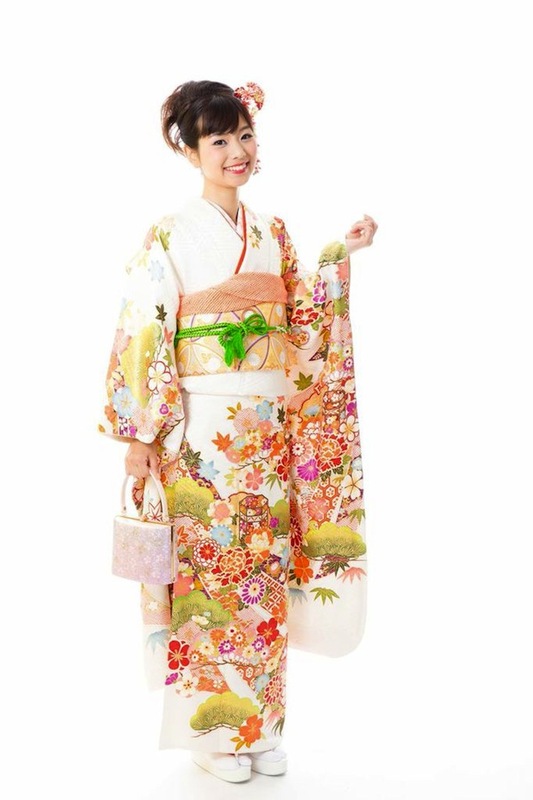 “Uchikake” is clothes that women wear on the kimono. It is usually gorgeous and thick at the bottom with some cotton. The cotton has the effects to make “Uchikake” look more gorgeous as well as to keep the bottom from rolling up or disturbing the feet. Today it is usually used for wedding, but it was originally a formal dress for women from Samurai families. At that time, the custom of layering had been passing away and people began to drape (“uchikakeru” ) another Kosode over a Kosode as a formal dressing, which is the word origin of “Uchikake” Uchikake of this period is specifically called “Uchikake Kosode” on some occasion. 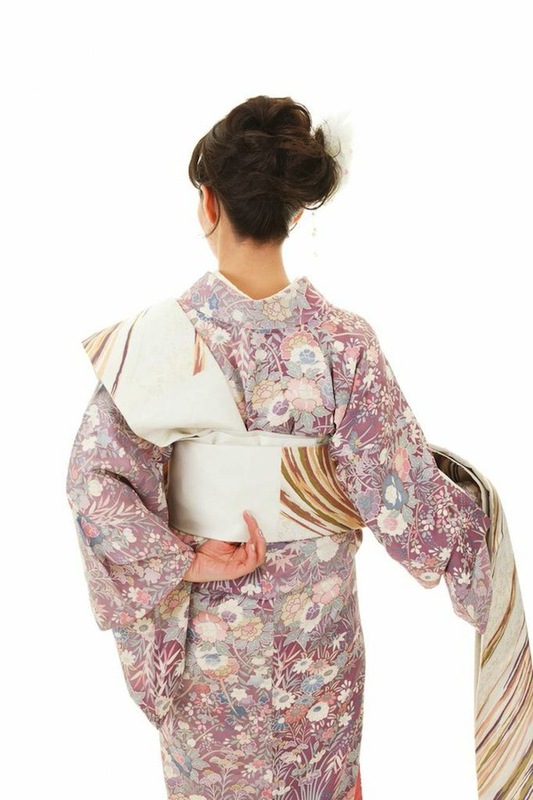 It is said that ordinary people started the custom of wearing it for wedding at the late Edo era. However, it also seemed that ordinary women occasionally wore it for some ceremonies even before it. Today there is Uchikake for summer, while it used to be only for the season from autumn to spring. So, it was very thick, and it was allowed to tie Uchikake at the hip to leave the upper body uncovered by it as a summer formal dressing. Shirabyoshi is one of the dances, which came about around the late Heian period or the Kamakura period. The dancers are also called as shirabyoshi. Sizuka Gozen is one of the most famous dancers and she often appears in period dramas. Originally, Shrabyoshi dance had a religious connotation. It was considered as the dance dedicated to gods. 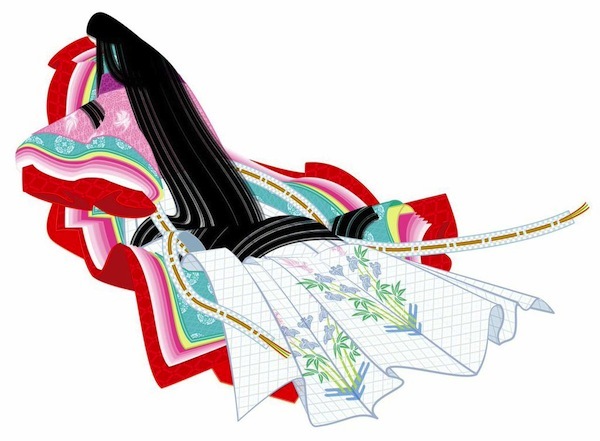 While some say that most of Shirabhoshi danders were prostitutes, many regard that they share the same origin as “Miko, ” maiden in the service of a Shinto shrine. This might explain the reason why Shirabhoshi’ s attire is similar to the one Miko wears today in many ways. One thing we should note is that Shirabhoshi’s attire is basically for men. They wear Suikan and Eboshi, a men’s outfit and a cap the men wore at that time. In many cases they even carry swords.The music and dances originated from Shirabyoshi have been played up to now as traditional art, Some enjoy as their hobbies. The attire itself is very popular and regardless of the fact that the word “Shirabhoshi” is not heard in general, you may find its outfit in many occasions. In general, Juunihitoe is a full dress for women in the Heian period. Juunihitoe in Japanese means ” twelve-layer robe,” but it actually doesn’t have twelve layers. Normally the following clothes are worn. The layers of Uchigi was not determined until the middle of the Hian period. 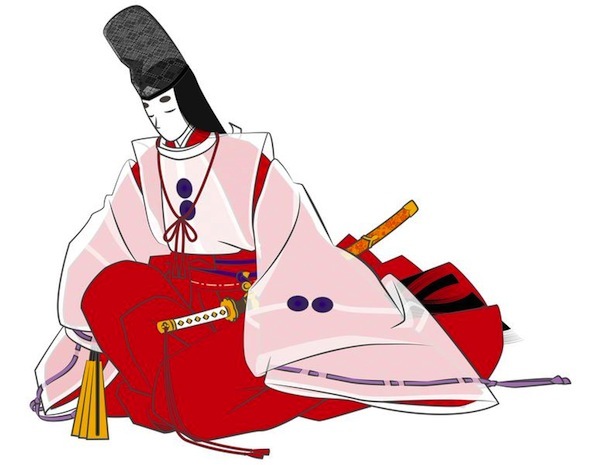 In the classical literature mentioning about the lives of people at the time, you can even see the description about a person who wears twenty layers of Uchigi. On the other hand, probably because of its inflexibility, the clothing became more and more simplified after the Kamakura period. The old ceremonial court dress is a men’s full dress and often seen in old nobles’ portraits. 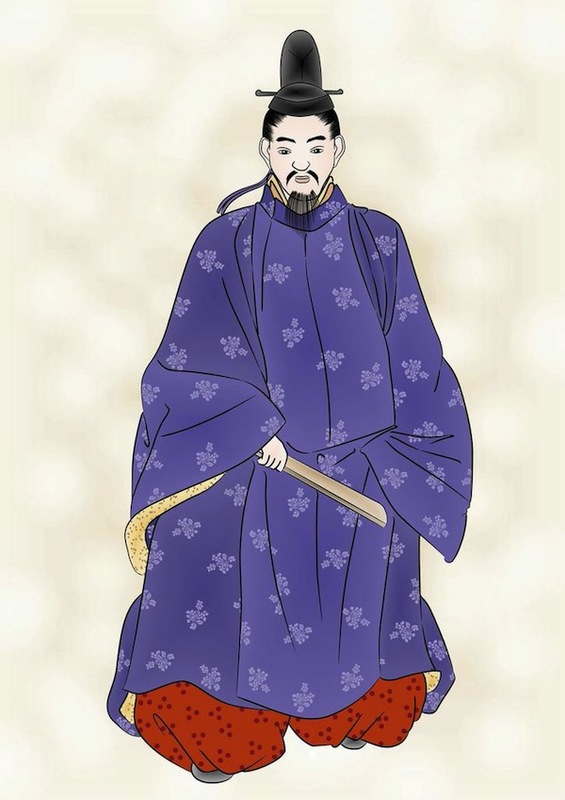 Japanese nobles gradually changed the traditional Chine noble clothing to make it something they would really like. They wore many layers of clothing to show their nobleness and eventually established it as a common style of clothing. To be in the old ceremonial court dress, layers of the following clothes should be worn in order. The more difficult to move so as to wear so many cloth,The more noble they are. But wearing so many cloth was tough for people in the era. In fact, Some people ommited Hanpi hidden by hou . The center part of eri (collar) is double-layered. The fabric that overs the collar is called tomo-eri or kake-eri. In general, it is called tomo-eri when it is made using the same fabric as kimono, and it is called kake-eri when it is made using fabrics from others. However, the given name is not fixed as it can be called kake-eri even when the same fabrics from kimono are used. You may consider that they both have the same meaning. Damages and stains are more likely to appear particularly around eri. Kake-eri is used over the collar so it can be removed to wash separately or replaced with another. When you watch a period drama, you often see ladies wearing kimono with only their collars that are black. That black fabric is kake-eri. Back then, it was popular to use black kake-eri so stains on collars were not noticeable. Originally, kake-eri are to be used over normal collars. But to reduce costs, there are some which are just folded so they look like kake-eri are actually covered. Also, when extra fabrics are added to the sleeves of kimono for larger people, there is no choice but to just fold the collars as kake-eri cannot be removed. Collars of this sort of kimono cannot be re-patched, but there isn’t any problem wearing it. For Yukatas, a word “Kawari musubi” is often used when we tie an obi. This is a collective term applied to tying methods without unique names. Please note that this is not a name of a particular tying method. Hanhaba-obi (half-width obi) is casual and because no rules are applied to it, Kawari musubi is often created using this type of obi. 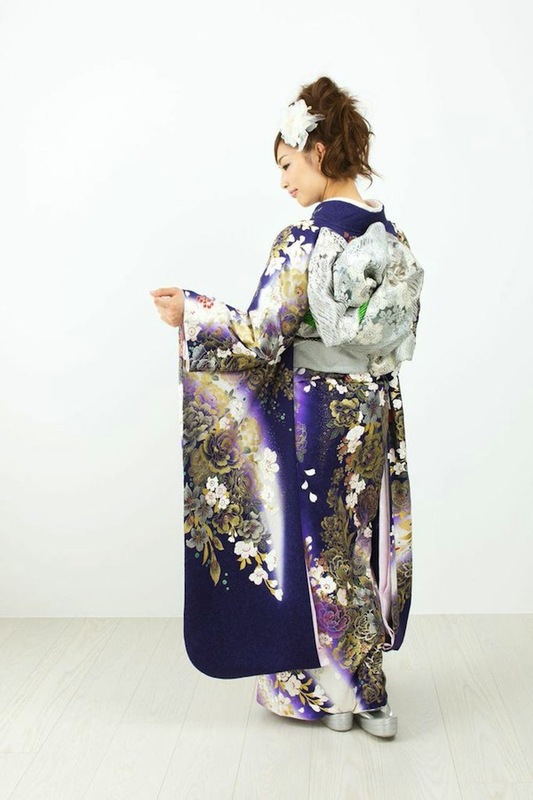 On the other hand, you can use Kawari musubi with Fukuro obi which is initially designed for formal scenes. In fact, a lot of people enjoy Kawari musubi with Fukuro obi. Particularly for Furisode, tying Fukuro obi in a way of Kawari musubi makes it gorgeous. Nagoya obi is relatively short, so it is unusual to tie a Nagoya obi in a Kawari musubi. Kawari musubi is a kind of improvisation by a Kimono dresser, and usually each of them has no name. Therefore, it is often difficult to ask your dresser to make the same Kawari musubi as what you saw by describing its appearance. If you would like the dresser to tie your Fukuro obi in the same way as one in a magazine, you should show the clip. As for Hanhaba obi, it is enjoyable to think various Kawari musubi by yourself. When you say tsuno-dashi now, it refers to a casual way of knotting Nagoya obi which goes with tsumugi (pongee) or komon (fine pattern). It is popular for its refined way of knotting. In fact, tsuno-dashi has been long around even before the otaiko-musubi (drum knot), which is currently more major. However, tsuno-dashi in old times was slightly different from the current one in terms of its way of knotting. What is common between the two is how the tips of obi from both sides of the part called otaiko is shaped. That shape that you see is called “tsuno”, and this way of knotting the obi is called “tsuno-dashi”. Now, tsuno-dashi are made using obijime (decorative string) and obiage (obi bustle). In old times, obi were not wrapped completely. The tip of tare (the edge of obi) was left under obi, pulled through halfway, made into a ring and hung. This method of knotting obi needs no obijime or obiage, but but it is too short for current Nagoya obi and too long for fukuro obi (double-woven obi). When Nagoya obi and fukuro obi started being used widely for otaiko-musubi, tsuno-dashi evolved too so to adapt these obi. As a result, the length that was suitable for old tsuno-dashi is no longer in use. There is this method of knotting obi called Ginza musubi which is like tsuno-dashi. However, the difference between “Nagoya obi’s tsuno-dashi” and “Ginza musubi” is not clear, and different people have different opinions about it. 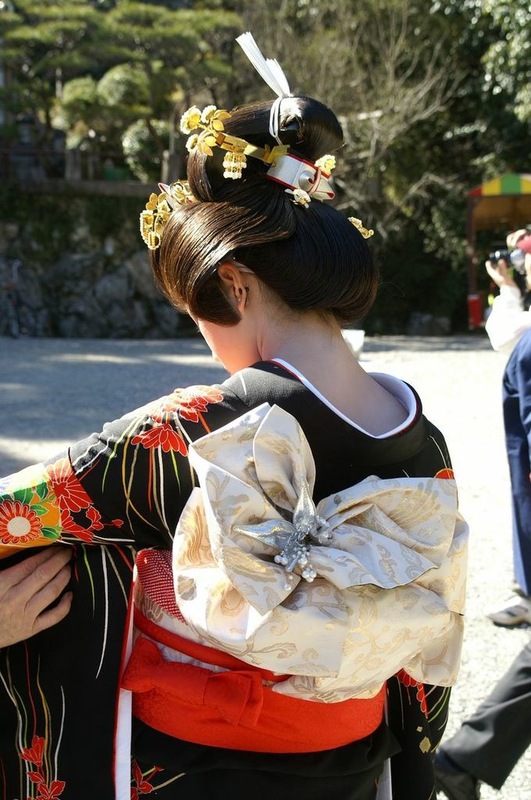 Even within Japan itself, how kimono are worn often differs from place to place. Giving an example with a big difference, there is this difference in wrapping obi from right to left and from left to right. When obi is wrapped from right to left in front of your body, it is called Kanto Maki. And the other way round is called Kansai Maki. As the names imply, Kanto Maki is mainly seen in the eastern Japan and Kansai Maki is mainly seen in the western Japan. Other than the case where there is a difference in tesaki (starting point)’s starting point being right or left, the complete look after wrapping the obi is the same for both methods. However, you should be careful that different part of obi’s patterns that are on the ventral side (hara-mon) may appear depending on what method you use, Kanto Maki or Kansai Maki. You will regret if you do not select an obi with patterns that appear as you like with the easier wrapping method for you when you wrap the obi yourself. When you have someone to wrap an obi for you, make sure you check which side of the patterns is to appear and clearly tell the person of your preference. it comes in handy if you can wrap your obi in 2 methods. You can use different sides of obi with two types of hara-mon, or you can use the other side of obi when one side is stained. Kuzu-fu are fabrics made from fibers of creepers of a kudzu, which are climbing plants. 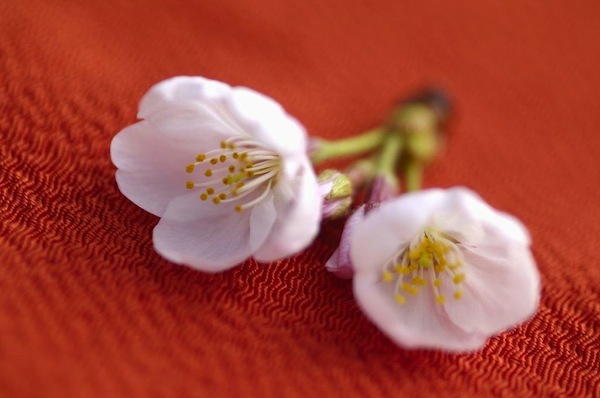 This is believed to be one of the oldest Japanese fabrics. Kuzu-fu was excavated out of the ruins of the Tumulus Period. There are descriptions about kuzu-fu even in the materials from the Nara Period and Heian Period. It is believed that kuzu-fu were widely used during these period. Now, their main production area is around Kakegawa City in Shizuoka Prefecture. There is also a description that says kuzu-fu were Kakegawa City’s specialty in the materials from the Edo Period. The distinctive characteristic of Kakegawa kuzu-fu is that other than kuzu yarns are used, such as cotton yarn, for tate-ito, and that kuzu yarns are used for yoko-ito that don’t twist yoko-ito. Whereas, for example in Kyushu area, it is said that they used tate-ito and yoko-ito which were both twisted. Kuzu-fu have a shine, and they were widely used as clothing for Kuge (court nobles) and Bushi (warriors) until the Edo Period. During and after the Meiji Period, such a trend was gone and they began to be produced as wallpapers. Kuzu-fu wallpapers were treasured as Japan’s exporting products, but South Korea soon began its production of kuzu-fu wallpapers and production of Japan’s kuzu-fu has decreased. Now, kuzu-fu are used as the materials for obi (kimono belts), zouri (Japanese sandals) and bags.